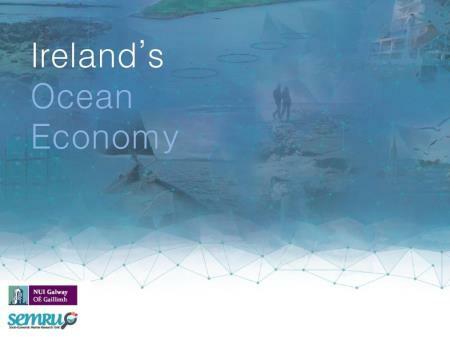 The Minister for Agriculture, Food & the Marine, Simon Coveney TD, will launch the latest report on Ireland's Ocean Economy at the 2nd Annual Ocean Wealth Conference, taking place in Ringaskiddy, Cork, today as part of Ireland's national maritime festival 'SeaFest'. The report, compiled by NUI Galway's Socio-Economic Marine Research Unit (SEMRU) and Teagasc, estimates that the sector contributed an estimated €1.4bn to GDP last year. Ireland's 'Blue Economy' is performing on average better than the general economy with up to 9% growth over the last five years. With an estimated turnover of €4.5bn, the sector employs approximately 18,500 Full-Time Equivalents and new data from shows that in addition to the direct impacts of Ireland's ocean economy, a further 13,000 are employed across the wider economy providing an additional €3.3bn in turnover. This is the third report on Ireland's Ocean Economy from NUI Galway's SEMRU as part of its ongoing process of collection and analysis of marine socio-economic data in Ireland funded by the Marine Institute. Results from the report show trends in Ireland's Ocean Economy over the period 2010-2012 and provides an estimate of the direct value in 2014. Minister Coveney, speaking ahead of the conference said, "Over the past few years we've seen a dramatic and in some cases radical transformation in Ireland's attitude towards the marine sector generally, with the marine now being viewed as a significant contributor to our economic recovery. This new data from SEMRU and Teagasc shows that Ireland's blue economy is performing well in established industries such as seafood, shipping and marine tourism, and is excelling in emerging industries such as high-tech marine products and services, marine biotechnology and maritime commerce." The ocean economy had a turnover of €4.2 billion in 2012, rising to an estimated €4.5bn in 2014. The ocean economy provided employment for 17,425 individuals Full Time Equivalents, (FTEs) in 2012, with an estimated increase to 18,480 in 2014. Over the period 2010-2012 a 33% increase in turnover is reported, a further increase of 7% is estimated for the period up to 2014. Employment has also steadily risen, with increase of 5-6%. Established Marine Industries represent 95% of the total turnover and 93% of total employment in Ireland's ocean economy. Marine retail services, sea fisheries and seafood processing, all experienced a significant increase in activity, with turnover, GVA and employment increasing across the sector in the period. The aquaculture sector also exhibited increases, albeit of a smaller scale, across all three variables. Emerging Marine Industries representing 5% of the turnover and 7% of employment in Ireland's ocean economy. In comparison to the established industries, the emerging industries are excelling in terms of growth. High tech marine products and services, marine biotechnology and bio-products and marine commerce experienced large increases in turnover, GVA and employment. Marine renewable energy experienced a more moderate increase in turnover but a large increase in GVA. In terms of employment, however, the marine renewables sector experienced a slight decrease with respect to 2010 levels. The previous Ocean Economy Report published in 2013 referred to the lowest point of the economic contraction (2007-2010), while this report represents a period of slow economic recovery (2010-2012), with a moderate increase in activity, particularly in the shipping and maritime transport sector and in sea fisheries, seafood processing and marine manufacturing, construction and engineering. Estimates based on recent economic indicators suggest a further increase in activity across established and emerging marine industries in the 2012-2014 period. Combined with the confident national economic forecasts recently released by the Department of Finance, the trends shown in this third SEMRU report suggest a positive outlook for Ireland's ocean economy in 2015. SEMRU also produced estimates of Ireland's Ocean Economy for the year 2014. It is estimated to be worth €1.4bn, 0.8% GDP. With an estimated direct turnover of approx. €4.5bn, Ireland's ocean economy employs in excess of 18,400 Full-Time Equivalents. "Results are encouraging", reports Dr Stephen Hynes of SEMRU at NUI Galway "they reflect the economic recovery that Ireland has experienced in the last few years. With the recognition of the potential impact of 'Blue Growth' on employment and output, at both a national and EU level, there has never been a greater need for reliable statistics on marine sector activity. Also, it is only by examining the ocean-dependent economy separately from the national economy that we will be able to understand the magnitude of what might be affected by future changes in the oceans and along our coasts." SEMRU, in conjunction with the Teagasc Rural Economy Development Programme, have also developed the Bio-Economy Input-Output (IO) Model. The Bio-Economy IO model studies the relationship between Ireland's Marine based and Agriculture sectors and the rest of the economy and can be used to estimate both the direct and indirect effects on output and employment arising from increases or decreases in the output of individual marine sectors. New data arising from the model shows that in addition to the people directly employed in Ireland's marine industries, a further 13,000 are employed indirectly across the wider economy providing an additional €3.3bn in turnover to the Irish economy. The results of the model suggest that for every €100 in turnover from Ireland's Ocean Economy, a further €78 is generated indirectly in other sectors of the economy and for every 100 marine jobs created, a further 75 jobs are created in other parts of the economy. The ocean economy report series and associated Input-Output model allows SEMRU to observe and monitor progress on meeting the targets set out in the Government's Integrated Marine Plan for Ireland - Harnessing Our Ocean Wealth (2012). Harnessing Our Ocean Wealth Strategy outlines a number of specific targets which seek to expand the Irish Marine Sector to a total of €6.4bn in 2020 representing an increase of €3.2bn on 2010. It is estimated that the achievement of these targets will also have additional "knock-on" economic impacts with additional growth of €2.7bn anticipated in the wider economy. Based on the results of running this scenario through the Bio-Economy IO model, it is estimated that 29,300 new jobs could be created if the Ocean Wealth targets are achieved with 16,100 of these coming directly from within the Marine sector itself. An additional 13,200 jobs are estimated to be created indirectly through increases in demand for products and services required by the marine sector. Prof Cathal O Donoghue of Teagasc added that with the collection of marine socio-economic data, "We are finally able to assess the direct and indirect impacts of national strategies such as Harnessing Our Ocean Wealth and Food Wise 2025 and their impact on employment and output in both the wider economy and in upstream and downstream industries. The impact of Ireland's ocean economy is particularly notable in Ireland's rural economy, as highlighted in the report of the Commission for the Economic Development of Rural Areas (CEDRA)". The Marine Institute is the State agency responsible for marine research, technology, development and innovation in Ireland. The Institute provides scientific and technical advice to Government to help inform policy and to support the sustainable development of Ireland's marine resource. Taking place in Cork Harbour on Friday 10th and Saturday 11th July 2015, SeaFest is a celebration of Ireland's incredible ocean wealth showcasing our abundant maritime resources. The SeaFest programme of events is extensive. The line-up includes the annual ocean wealth conference, seafood fair, seafood cookery demonstrations with celebrity chefs and seafaring family fun, tours of the Irish Naval ships, a Parade of Sail ending in Cork City, leisure craft and boats, the Lee Swim, exhibits on marine life and all manner of festival entertainment for every age group. Published in 2012, Harnessing Our Ocean Wealth sets out the Government's Vision, High-Level Goals, and Key 'Enabling' Actions to put in place the appropriate policy, governance and business climate to enable our marine potential to be realised.